..so they dance! : My favourite Indian directors. In my last post I talked about being a newbie and not knowing certain things or what's what when it came to certain things. I think one of the questions I couldn't have in any way answered during my newbiedom was "Who's your favourite director in Indian cinema?". For one, I didn't pay attention to directors - only the stars of films. Second, even if I had, I hadn't seen enough films by any director to know whether I liked them or not. But, I'm glad to say, now that I've seen enough films, when the question is put forth, a number of names instantly come to mind. What makes a favourite director for me? Well, for one, I have to have seen a lot if not most, if not all of their films. I have to (obviously) enjoy the films I've seen by them. I have to get why they make the kind of films they make. And I also have to anticipate their up-coming films (assuming they're still directing). So, dude's only made two films, Ek Hasina Thi and Johnny Gaddaar, and you know what? Friggin' adore both films. And now he's in the process of making another film starring my on/off favourite actor, Saif Ali Khan. I think Raghavan is the Tarantino of Hindi films, if we must make such comparisons - he is a huge film fanatic, who loves films of all sorts, and he mixes these influences into his films (you only have to read his piece on Rediff about his favourite thrillers to know this). However, unlike Tarantino with his self-indulgent dialogues, I think Raghavan keeps his films tightly plotted. They're not perfect films, don't get me wrong - there are things I'd change about both of them, there are things I'm sure he'd change himself, but they are good films, no two ways about it. I hope he makes plenty more. Yeah, I am an eternal Kunal Kohli apologist. He made Hum Tum, which I loved (despite its flaws), he made Fanaa, which I loved (despite its flaws), he made Thoda Pyaar.., which I loved (despite its flaws and the fact nobody else did). This critic-turned-director is not generally immensely appreciated. But I like him, and I get him - like Raghavan, he's a filmi fanboy. Sometimes, that can be a good thing - he constructs films that aren't the tightest or the best when it comes to plot, and that really require suspension of belief. Sometimes, it's not necessarily a good thing. For example, I get the sense he loved everything Aamir did in Fanaa so much he didn't necessarily direct the actor much. But I think Kohli makes films that feel right, and have those magical filmi moments that just click with me as a viewer so strongly I adore him for it. Like the antakshari scene on Fanaa, or the argument scene in Hum Tum, or the sindoor in Mujhse Dosti Karoge. To Thoda Pyaar's disadvantage I have to say, the film lacks those moments in large part. But it's fun fluff regardless. King of Masala. King of Mass-entertainers. King of crazy, funky, fantastic entertainment. I wonder, how this man was talked about back in the day? Was he considered the David Dhawan of his time, sort of looked down on but very popular regardless? The Priyadarshan? I want to say no, because I think Desai really believed in the type of cinema he was making - he wasn't just making it to make money. There's wildness in his films that captured the imagination of the audiences. I mean, I can think of a story wilder than Dharam-Veer, for sure, but I could not imagine it into a blockbuster that would live on as a classic masala film to this day. The over-the-topness, the fantastical story tropes, but also the heart at the core of these films, all of these make Manmohan Desai a name I can trust. He debuted with Nuvvostanante Nenoddantana (a film that flows through choreography), continued with Pournami (amicable effort, though not a huge favourite) and began in Hindi industry by giving them Wanted (a show that Southie rules in action masalas, but the format can and does work for Hindi audiences, too). Plus he's an awesome dancer and choreographer. Again, he's not done a whole lot when it comes to directing but I love what he has given to the world and I anticipate his future efforts. I've talked about his guy a lot but I can't get over how spell-binding his latest effort, Naan Kadavul (review here) was in all its grimness. Plus I adore Pithamagan, for not being so totally hopeless. 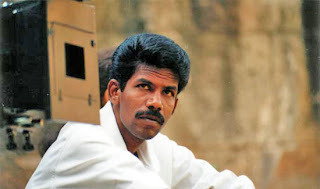 And this guy, if there any directors who make films like his somewhere in India, I've not heard of them. I think he has a totally unique vision, the kind that looks that things that are grim and dark and awful, but also rooted in some sort of strange humanity. And all these characters that are outsiders, and characters who do bad things but who still feel relatable - in other words, complexity. Another Southie director! This guy is the real successor to Manmohan Desai, if anybody in Indian films is. He makes the most bombastic, insane, masala to the nth degree that has everything, visuals, comedy, music, CGI, star power. In true Thamizh style the heroes smash social problems with a simplistic philosophy - curing social ills one baddie at a time. I adore Anniyan but I also enjoyed Indian and his Hindi venture, Nayak: The Hero. And then there's Sivaji, and the up-coming Aishwarya-Rajni film Robot/Enthiraan. Shankar is something you have to experience to understand, and then experience it again, to truly understand. Gosh, there's actually quite a number of people whose films I love. Go figure. What are your favourites? Feel free to make your own post, or just answer in the comments. I'm really curious! I've really enjoyed every Prabhu Deva film I've seen, so totally agree with you there. Don't forget he did Pokiri, too, the Telugu Wanted original. While reading your post, it occurred to me that the only director who comes to mind when I try to recall multiple films by the same guy/girl is Sanjay Leela Bhansali. And while he's given me some wonderful filmi moments, I can't say that I'm so much a fan of his style as I put up with it with a lot of eye-rolling to get my music and spectacle. 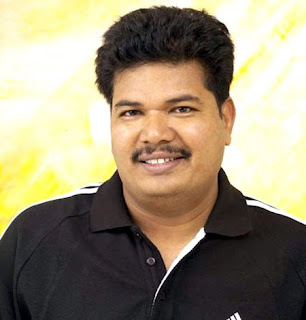 Enjoyed reading about your fave directors and why you love them.... After seeing 'Wanted', reading your posts (particularly the ones on 'Benny Lava' and your favourite heroes) got me interested in Prabhudeva's Southie directing efforts - I LOVED NVNN but haven't seen 'Pournami' yet. Every now and then I do features on directors on my blog, although strangely enough, I usually don't pick my very favourite directors to write about. The only director that I LOVE and whose work I have written about is Hrishikesh Mukherjee, my all-time favourite... I think I will take you up on that last line and write about some of the others that I really love. Let's see... I love OP Ralhan for his ideals and his dedication to providing the maximum amount of zazz to every film he did. I love Manoj Kumar for the exact same reasons. 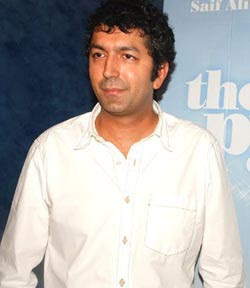 I agree on Kunal Kohli for sure (I also loved Thoda Pyaar) and I also really like Kabir Khan. Farah Khan, despite the fact that she only has two films so far, and her hubby Shirish Kunder for making Jaan-e-Mann in all it's loopy glory. Pradeep Sarkar. Parineeta was the most visually arresting film I've ever seen. Laaga Chunari Mein Daag had some plot issues, but Sarkar did a marvelous job with the direction. Can't wait for his new one with Neil Nitin Mukesh. Great article as usual. Sriram is one of my favourite directors (if not the most) Love EHT and JG. 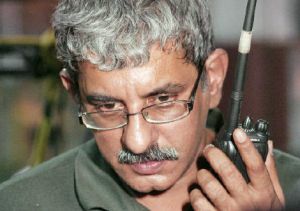 The guy is so talented .. he is a great script writer as well as great director. Really nice guy and very humble too. Have been waiting for AV impatiently forever. Vishal Bharadwaj would be another. Will watch anything he makes. Farah Khan is my number one for originality if nothing else. But hey what about Hrishikesh Mukherjee? He did his own thing back in that day,and I think one of a director's greatest strengths is the courage to do something different in an industry that tends to dictate the way things are done because it is a business after all,and some producers aren't adventurous. And finally I'd say Shekhar Kammula who directed the Telugu Anand and Godavari.He does put his touch of jadoo in his movies, also going against the tide in the action-dominated Tollywood industry. Btw,I think the JBJ director is called Shaad Ali. And I share your fondness for Kunal Kohli.What went wrong.He's got something going there, na? it just didn't click..
Ooooh, great post! You've been posting a lot of great stuff lately. =) Maybe I'll do a post about my favourites... Though first I'll have to figure out who they are, lol. And yeah, it takes a while to gather multiple films by directors and figure out which ones you like. There's some I've seen plenty of but still wouldn't call myself a fan. KJo is one. DG - Ahh NVNN is great. :) Hrishikesh Mukherjee is great but I haven't seen enough of his films to classify him as a favourite. dayshaze - Parineeta is indeed gorgeous. vivster - Yeah, Agent Vinod better be good! rhilex - Thanks! Yeah, it takes a while to figure out. It's not something I spend a lot of time thinking about, but as of late I've noticed I do tend to rate directors according to how much I can rely on their name, so to speak, for quality & interesting films. In Hindi i would say my favorites are Hrishikesh Mukherjee & Guru Dutt. I also quite like Raj Kapoor's films. In Telugu, I agree with Pardesi - Sekhar Kammula is my favorite. I also love K.Viswanath & Jandhyala's movies. Just a correction Ajnabi: The original Telugu Pokiri was directed by Puri Jagannath. It Tamil remake Pokkiri was then directed by Prabhudeva. Good post Sanni. I always enjoy reading your posts coz they are straight from the heart ie things that appeal to you and what you have liked in movies etc. 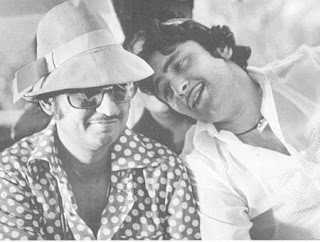 To answer your question about Manmohan Desai - he was very popular indeed in his times. He was well known as a successful producer and director and respected. He was not looked down upon. It is indeed painful to see a kind of snobbery now a days when people like David Dhawan and Priyadarshan are looked down upon. Films made by these people are enjoyed by audience and they should get their due credit although I am not a big fan of David Dhawan comedies myself. Again priyadarshan has made many movies in malayalam and hindi and some of his movies are quite good and deserves professional respect and recognition. Some of my fav directors are Manmohan Desai, Hrishikesh Mukerjee, Basu Chatterjee,Ramesh Sippy (Sholay, Andaaz), Shyam Benegal, Govind Nihalini, Yash Chopra (Deewar, Trishul). No Hrishikesh Mukherjee? He's one of my faves and a must-have classic director. I also really like Mani Ratnam, Vishal Bharadwaj, Amol Palekar and Manmohan Desai. Heyy , you are a true Indian movie enthusiast ... woww.. and Bunty aur Babli and JBJ's director is Shaad Ali , he also directed Saathiya , he worked as an Assistant director for Mani Ratnam..